I just wanted everyone to know that Red Robin is now carrying gluten free buns. 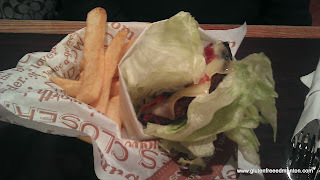 It was announced a while ago that Red Robin's in the United States were carrying Udi's gluten free buns. Last time we were at the West Edmonton End location the waitress let us know that they are too carrying gluten free buns. Red Robin still does not have anything official on their website, but you can click here for more of the allergen info. I will say, although Red Robin offers a gluten free bun, Amanda still loves the lettuce wrap option. Go figure! Let us know what you think of eating a Red Robin burger on a bun! As some of you may know, my brother is a foodie blogger too. At Haggis and the Herring, he writes about tasty recipes he tries out at his home in Toronto. Often talks about the experience with his wife, and kids preparing and eating the food too. 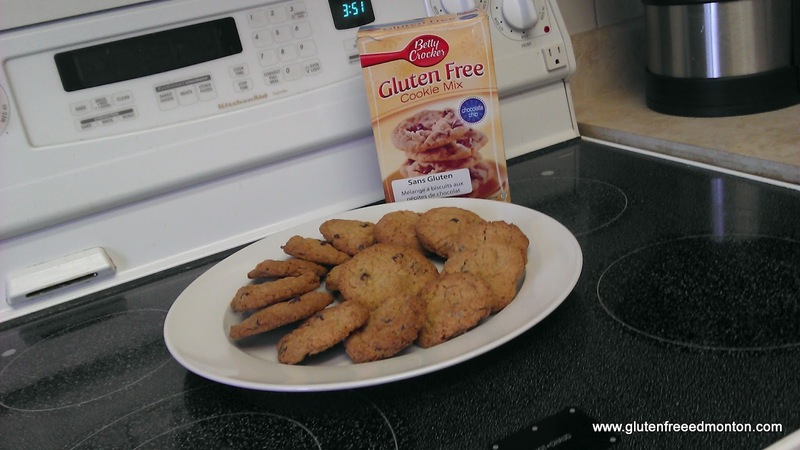 His blog is not a gluten free blog, but you can easily adapt recipes to be gluten free. He keeps on telling me about this awesome chicken shawarma recipe he tried out from a friend and how everyone just loves it. Even one of my uncles that can be pretty picky loved the recipe. He really pumped up the recipe to be one of the best on his blog, so I really had to try it out. It also didn't hurt that everything about the Shawarma recipe is naturally gluten free. And guess what? Yummmmm! He was right, fantastic recipe! And it went perfect with the tzatziki like sauce he calls 'magic sauce' on his blog. 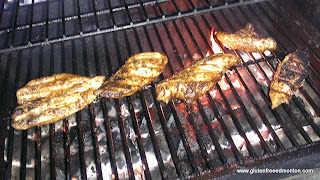 Marinated chicken on the grill! Yum! The Shawarma isn't difficult to make, it just requires lots spices and an over night marinade for the chicken to absorb all the tasty flavours. Shawarma is usually served as sliced chicken pieces. I was kind of lazy so just filleted the chicken instead of chopping it up. I filleted it to be sure it still absorbs the flavours nicely. 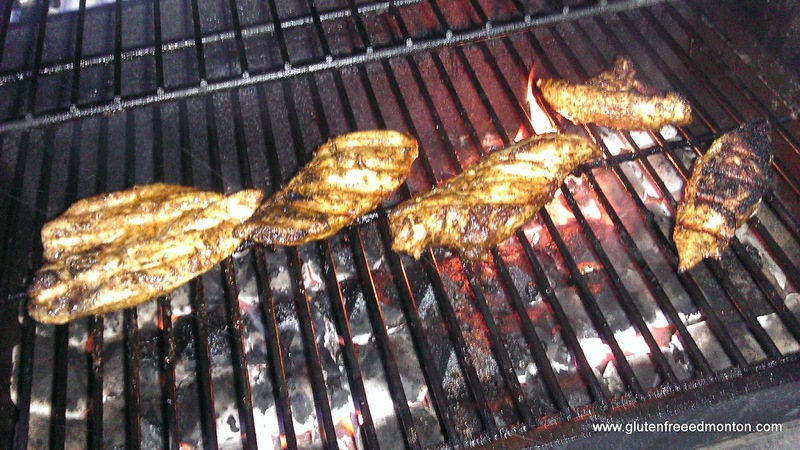 I must say filleting the chicken vs. cutting it into smaller pieces was cheating a bit, but it really made things easier to grill. The recipe also called for boneless skinless chicken thighs, and we had boneless skinless chicken breasts, which was perfectly fine. It is just a more expensive meat to use on something that is going to have its flavour totally altered anyways. The BBQ is my favourite cooking tool because you get some great smells off a BBQ, and the smells this chicken gave off were incredible. I usually come back into the house smelling more like a smoke and meat, but not this time. 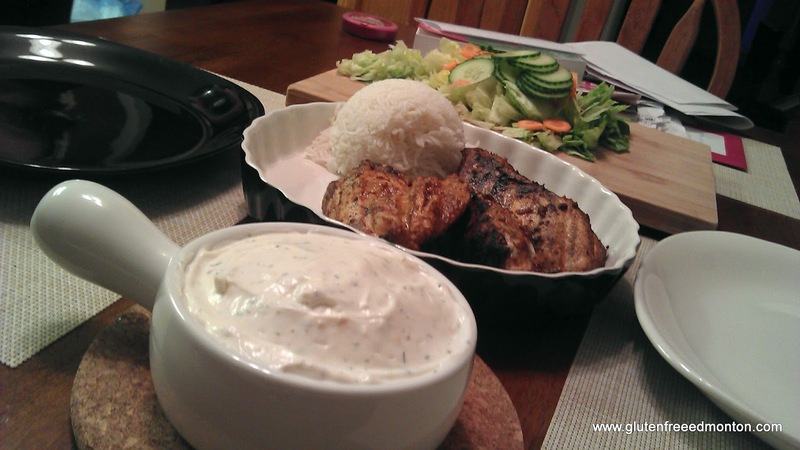 The magic sauce was our first attempt at making ta type of tzatziki. We couldn't believe how tasty the sauce was. It uses greek yogurt and mayo as the base and you add flavour like dill, garlic, and red wine vinegar. The recipe makes a lot of the sauce. If there is just two of you, you could get away with halving the recipe. There was still more sauce beyond what's in that ball in the picture. We served it all with some rice to try and make it as much as a Mediterranean meal as possible. So you probably want the recipe already eh? I can imagine reading this far, has you hungry and ready to get started already. 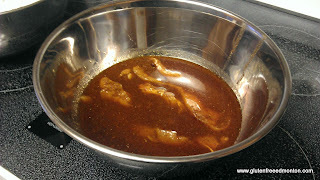 Well, you just have to check out www.haggisandherring.com for these recipes. Wow! 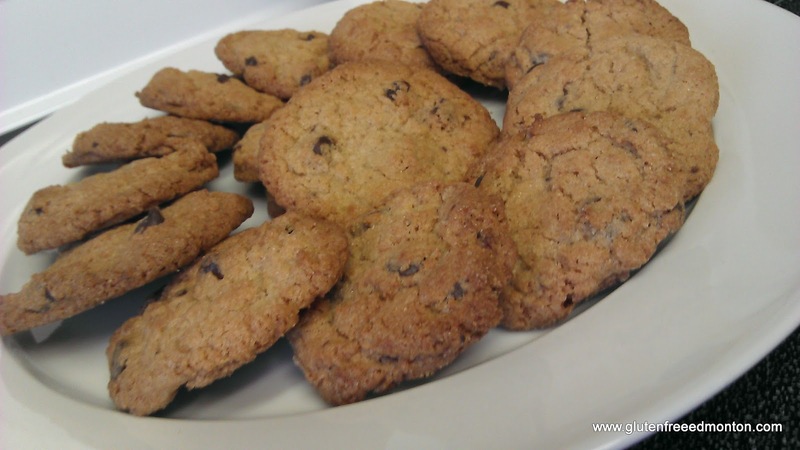 I wish I could take complete credit for these super easy super fantastic Gluten Free Chocolate Chip Cookies, but since I know it's not right to take credit for other peoples work, I'll be honest and give the credit to Betty Crocker for these tasty treats. We got this gluten free chocolate chip cookie mix awhile back, I believe I bought it in Winnipeg, Manitoba on a trip to visit family. However I do recall seeing this same package in Edmonton more recently as well. I would definitely recommend this mix as a quick and easy substitute for made from scratch cookies. Seriously, all you have to add to the mix is a stick of butter, one egg and one teaspoon of vanilla. How much easier could it get? Really? It is often very tough to find gluten free restaurants in an airport, let alone someone with a gluten free menu, or good options. We have previously written about Miletsone's having a gluten free menu, and how great it is to have a gluten free menu at such a large nation wide chain. At airports, chain restaurants typically have a condensed menu, so that means even if there were gluten free options or a gluten free menu, they may not exist. 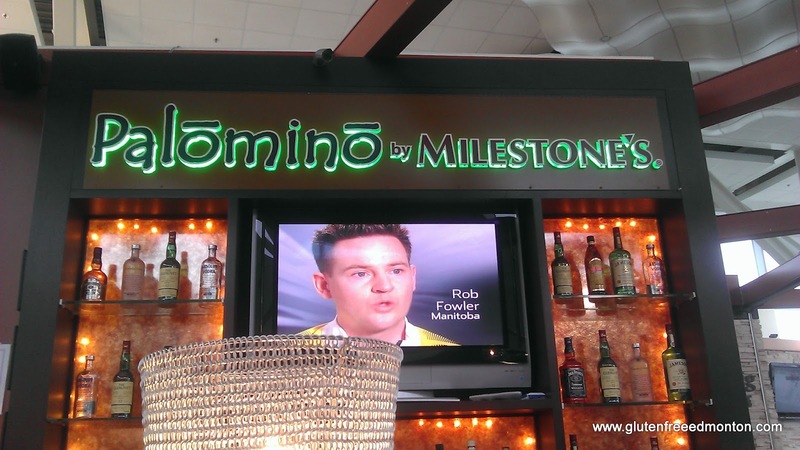 At the Palomino by Milestones in Vancouver's Airport, I was surprised to see a gluten free option on the menu. 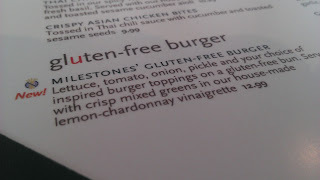 It's true that they didn't have their full gluten free menu, but they did have their now famous gluten free hamburger! Was certainly a surprise to see on the menu. I recall when I was first diagnosed with celiac disease just over 2 years ago and I was so thankful that in Edmonton we had access to a gluten free store like Kinnikinnick. I remember people saying that you could buy their gluten free products at most major grocery stores, but I will never forget my first time going into the actual store. Like virtually everyone living with celiac disease I was seriously overwhelmed at that point. I was worried that I'd be stuck eating foods that tasted like dirt and had the texture to match (ick). We had tried a few other brands and different products, but everything changed when we went to Kinnikinnick. We were welcomed by helpful and courteous staff who actually knew what they were talking about and understood the needs of those requiring gluten free foods, unlike going to a large grocery store where they can tell you where to find things but little else. We were instantly amazed by the fresh variety of gluten free products found through out Kinnikinnick as well as the large quantity of frozen and packaged goods. I will say that my all time favorites at Kinnikinnick are their breads, cupcakes and of course the raisin spice cookies. 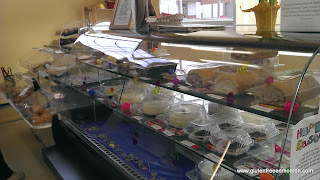 Most recently they have added bakery bins offering freshly baked buns, bagels and muffins. As well as their soft breads, fresh baguettes and various flavors of fresh foccaccia breads just to name a few of their new products. 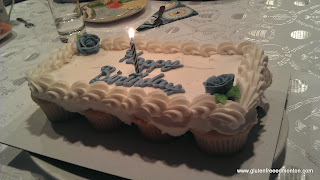 And don't forget you can always custom order a gluten free cake like I did for my birthday this year...my family is still raving about it. I was recently in Vancouver for the BC Patient Safety & Quality Council's Quality Forum. There was a one day Social Media Camp that I was asked to speak at. It was a great opportunity that I could not turn down. Before going I tweeted out to @gfvancouver and asked for any suggestions downtown near my hotel. Their first suggestion was St. Regis Bar & Grill. So my first night, that's where I ended up. It also helped that when I asked the concierge where to watch some hockey, they suggested St. Regis as well. So, a guy walks into a bar... ba da bing... well, walking into a bar you typically don't think gluten free or Celiac friendly. Considering typical pub grub is all battered and deep fried. 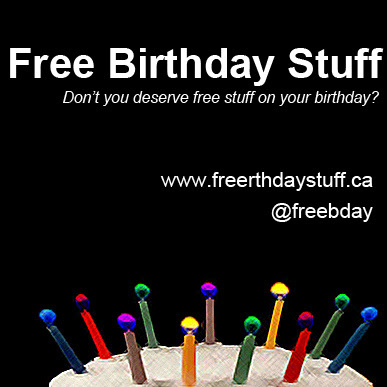 But @gfvancouver chose well. They carry gluten free bread for their sandwiches and gluten free penne pasta for their pasta dishes. Not all their sandwiches are gluten free, e.g. I wanted their beef dip, but their dip is thickened with flour. Their wings are floured, and their fries also do not have a dedicated fryer. Since I was alone, I just sat at the bar to watch the game and eat some grub. 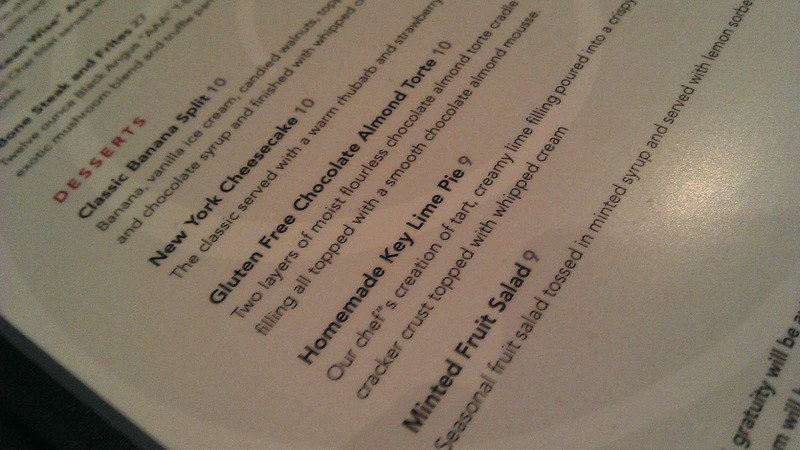 The manager was working the bar and he knew the most about what was gluten free and what was not. 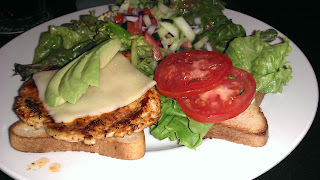 I had the California Blackened Chicken Sandwich on gluten free bread with a salad. 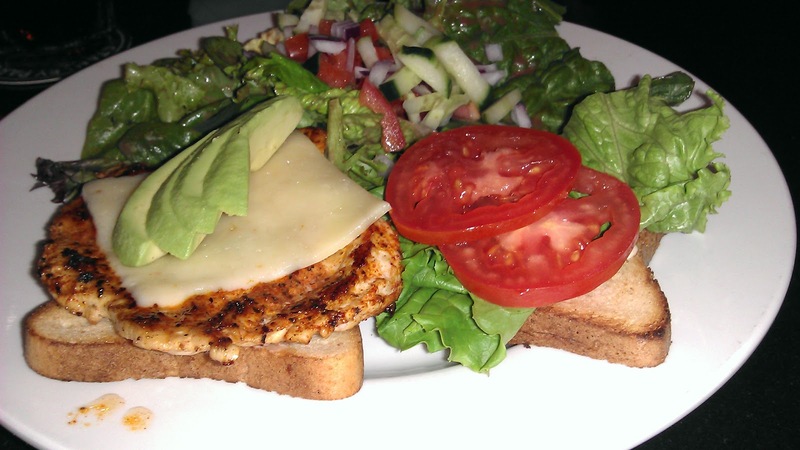 The chicken breast was nicely flavoured, and topped with lettuce, tomato, avocado and a mayo. Very tasty, and the bread didn't fall apart. Now, knowing that I do not have Celiac, and I was just doing this for the blog, I totally forgot that I was eating a gluten free sandwich. That's how good the bread was. I don't know who's bread they use, but it may be someone local because they also had a gluten free chocolate tart. Fantastic tart! He said he didn't know who makes it, but it is local. I imagine the bread was too. Oh ya, no surcharge on the gluten free sandwich. Bonus! I hope you check out this place too. I didn't ask about gluten free beer, but I wouldn't be surprised if they had. On Friday before the first Passover seder we had the pleasure of speaking with Brent Wittmeier from the Edmonton Journal. He wanted to know about some of the obstacles and benefits of celebrating Passover with Celiac Disease. Amanda and I had a nice chat with him over the phone for about 20 minutes. Amanda shared her experiences with finding new and unique gluten free kosher for Passover meal options. As the article talks about she also expressed her happiness to have found a gluten free matzah (that actually tastes pretty good), to be able to participate in all of the Passover traditions/rituals. We would like to note a couple of things about this Edmonton Journal article titled "Celiac seder: On the challenges, joys, and solutions to dietary problems at Passover". One of the Rabbi's in the Edmonton Community was quoted as saying "...balancing allergies and dietary restrictions has never been easier... In some other cities with bigger Jewish communities, oat and spelt matzahs are readily available for those with wheat issues.” As most Celiac's are aware, spelt and oat's (unless certified 100% gluten free oats) are not considering safe for a gluten free diet for people with Celiac Disease. Unfortunately this is a common misconception. Secondly and much less important to the Celiac community, we do not consider ourselves to be Orthodox in our practice of Judaism however we do attend an Orthodox Synagogue. Amanda and I at GlutenFreeEdmonton.com would like to extend a big thank you to Brent for sharing this story. Click here for the article. Steve writes in about Chianti, which is Amanda's favourite place for gluten free pasta. 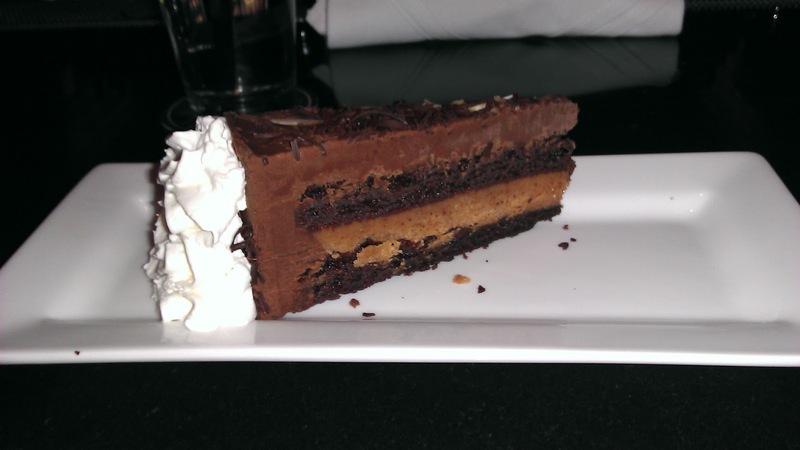 We love to eat there, but always forget to take a picture and blog about it. I guess we take it for granted because we eat their all the time. ...Chianti's in the University/Whyte ave area in Edmonton. With the exception of the high level dinner I have yet to find a restaurant with staff as knowledgeable about celiacs disease. Almost any item on their menu can be ordered and substituted for gluten free pasta or you can create your own pasta dish by choosing the sauce and any other add-ons (spicy italian sausage is my favorite). They also have several awards from various celiac associations and have been serving gluten free pasta for some time. 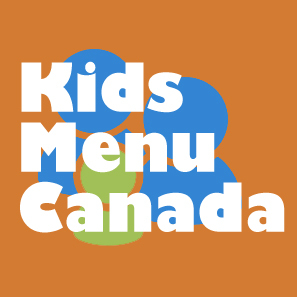 I simply can't recommend them enough, there may be some restaurants capable of matching their quality of service to those with celiacs disease but certainly none can beat it. In addition to the Whyte avenue location they now have a Clareview location as well. We already have a review of Milestones and their gluten free menu that was submitted by one of our readers, but they only had tried their gluten free hamburger. Recently our friend RL, whom often guests posts emailed me this awesome pick of the Tomato Basil Brown Rice Spaghettini served on Milestones gluten free menu. I had to share this because it looks soooooooooo good. 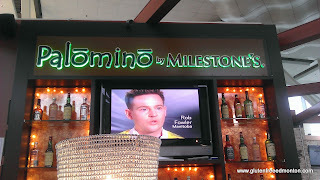 Click here for Milestones gluten free menu, it looks like it is worth the visit.